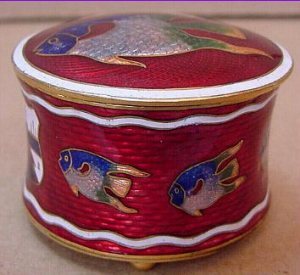 this is a gilt metal (maybe brass) cylindrical box or casket with a colourful cloisonne enamel decoration on a ruby champleve background. 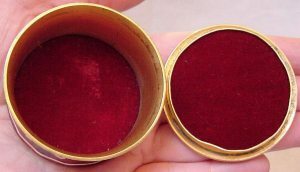 The box stands on three small ball feet and is lined with crimson velvet. 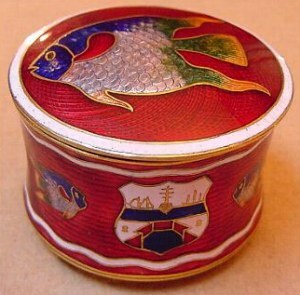 The vacant cover is decorated with a large cloisonne angelfish, while six smaller fishes and a shield shape crest with three sailing vessels are all around the sides of the box. 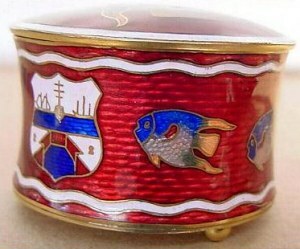 The badge was identified as part of the emblem of the island of Bermuda. It shows three ships at sea and a 'wet-dock' with closed gates in the foreground. 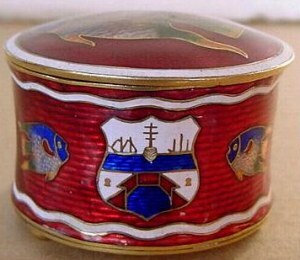 The original, introduced in 1875, was derived from the seal of 1817 and was replaced in 1910 by the current official badge of Bermuda (information courtesy Audrey Hall). 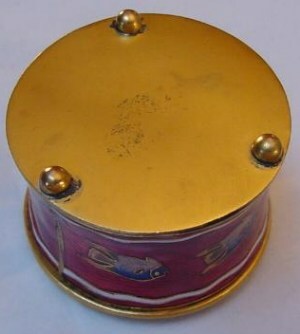 The box is unmarked and I'm unable to locate where and when it was manufactured. 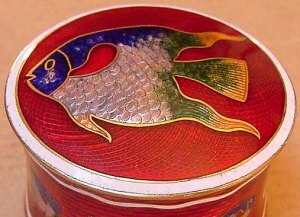 The enamel decoration is of high quality and suggests China or Asian origin. 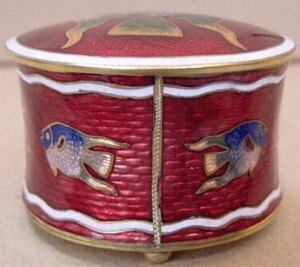 Any suggestion on the origin of the box would be greatly appreciated. 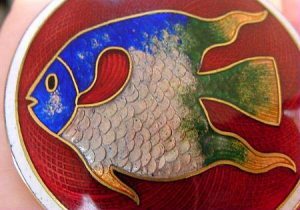 You may email to giorgio.